A goodbye email to coworkers is a smart career move. On your last day at work, you could sprint for the exit with a war whoop. Maybe knock over the company gumball machine on your way out. But—your future. That little thing about burning bridges. A.K.A. networking. Any coworker might be the next Bill Gates or Indra Nooyi. Anyone could hold the ticket to your future dream job. A goodbye letter isn’t just a good idea. It’s crucial. How to write a farewell email that strengthens relationships. A goodbye email to coworkers sample you can convert and use. 10+ great farewell email to coworkers examples for different types of colleagues. Why a farewell letter could be your smartest career move yet. Ready? Here’s a farewell email sample. Try to spot why it works so well. Keep reading to see farewell letter to coworkers examples, and how to write yours in five easy steps. Knowing how to write a farewell email means understanding why. Respect is good for your soul. But it’s great for your career. The overwhelming body of research shows networking significantly increases salary growth, job performance, and career satisfaction. Meet Elle Torres. She networked her way into a six-figure job with an unfinished degree. Where did her big offer come from? A contact she’d known for years. You never know where that dream job will come from. Keep that in mind as you write your goodbye letter to coworkers. Then all your writing choices will be easy. Okay. You’ve seen the great farewell letter sample above. How do you write a goodbye email to coworkers? Send short, personal farewell emails that reinforce relationships. That sends exactly the wrong farewell message. Why not send a farewell business letter when you leave? You want your coworkers to feel important. To focus on relationships, stick to short, informal emails. What better way to say, “You don’t matter” than a group email? Then customize each goodbye email to coworkers. Pro Tip: Should you send a fresh email to every coworker? Start with farewell email templates. Spend more time customizing for cherished contacts. For others, change the name and one or two details. Not sure how to start a goodbye letter? What if one of your connections is a future Sheryl Sandberg? There are 27 million entrepreneurs in the U.S.
That means 1 in 10 people you meet is a potential future business leader. Even more if you count C-Suite executives. Show you understand that in your farewell letter. Briefly mention your excitement for your future. Then move on quickly to what you’ll leave behind. These two goodbye email to coworkers examples show right from wrong. As you know, I'm leaving my graphic design position here at Redinger & Hoff. My last day is August 12th. I'm excited to start a new chapter, but I want to let you know how much I’ve enjoyed working with you. The first of our farewell email to coworkers examples keeps your future plans vague. That puts the attention where it belongs. Yowch. Way to rub it in. Ears will be steaming after that goodbye email to coworkers. Pro Tip: Need goodbye email subject line examples? Keep your resignation email subject simple. Departure, Farewell message, or Moving on will start on the right foot. You could just say it. Use specifics in a goodbye email to coworkers. The right details prove your coworker is important. Without your insights, our team would never have won the CSS Design Award. Your guidance has helped me grow as a designer in ways I'd never have expected. You also introduced me to my new favorite book—The Art of Looking Sideways. That goodbye email does it right, with details. I really appreciate you and value our relationship. You’ve been a great coworker and I’ll always value our experience together. Yep. Generic. I don’t feel special. Do you? Not with that goodbye letter. Something you learned from them. What you’ve gained from the relationship. Some way they helped you. A funny moment or memory you experienced together. Use 2–3 of those specifics in each goodbye email to coworkers you send. Pro Tip: Your details will vary in a goodbye email to a manager, senior, coworker, or direct report. Customize your approach for each. I’ll show how in a minute. It’s three years from now. You’re unemployed. Then the phone rings. It’s a former coworker. She asks, would you be interested in a cushy job offer? 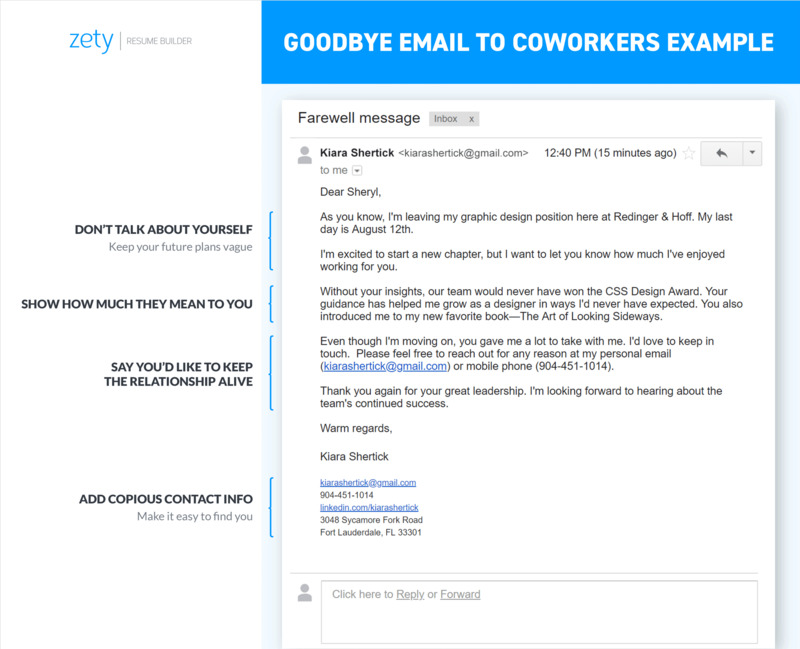 The best goodbye email to coworkers leaves the door wide open. Even though I'm moving on, you gave me a lot to take with me. I'd love to keep in touch. Please feel free to reach out for any reason at my personal email (kiarashertick@gmail.com) or mobile phone (904-451-1014). Nice. Your colleague will feel honored by that farewell letter. She’s obviously part of your inner circle. Let’s keep in touch! You can find me on LinkedIn or use my contact info below. Thank you and goodbye. That feels form-letterish. It’s not memorable and it doesn’t belong in a professional goodbye email. Pro Tip: Never spring your departure notice in a farewell email to colleagues. Always tell your boss in person first. Then send a resignation letter. Goodbye emails come last. You just got a referral for a fat job. Where did it come from? A past coworker and a farewell email. A great farewell letter stresses the importance of the relationship. Adding lots of contact info is like a ten-foot welcome mat. Pro Tip: Include lots of contact info. Adding more to a goodbye letter makes your connection feel significant. You can start with the same template for each goodbye email to coworkers. Remind them that you’re leaving, and the date. 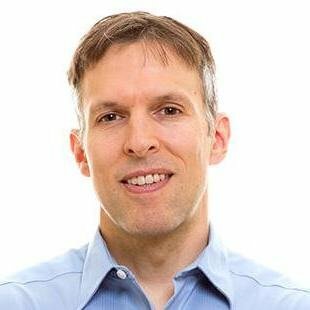 Reference a couple details that show why you value them. Offer to stay in touch. This farewell to a colleague shows how to pick a positive detail. A goodbye email to coworkers after resignation should focus on a strength the person likes about herself. You’re an expert at something most people don’t get—reading the room. I’ll never forget when upper management pushed to lock in Innotech as a supplier and you spoke up for us. Had you not done that, we would have lost tens of thousands that year. I’ve tried to learn that skill from you. A farewell letter to an employee can speak to their strengths. Your cheerful attitude was a joy to be around every day. You may not remember, but after we lost the Klimson account, I was feeling pretty gut-punched. Your kind attention and bright attitude refocused me on our new business outreach. Feel like burning bridges with your manager? Don’t. A thank you letter to your boss when you leave work is the smart move. When I wanted to buy the new editing software, you could’ve just said no. Instead, you took the time to explain your reasoning. Your business insights gave me a tool to make decisions easier. I’ve appreciated that ever since. Every company likes to talk about family. This company actually embodies it. The Amazon gift card you sent out of the blue may have seemed small to you, but I often think of it at unexpected times. I really enjoyed getting to know you. It was a pleasure working with you on the Cloud Management project. Your ideas and insights helped make it a success. It’s been a pleasure working with you these last four years. I really appreciate all your business. Most of all, I’ve enjoyed our talks about fly fishing. The samples above make for great last working day emails. Here’s one last piece of advice: Resist the urge to send a funny goodbye note. If your coworker has a great sense of humor, use quips like, If I don’t see you again, so what?” at your own risk. They can backfire too easily in a farewell email to colleagues. Pro Tip: Don’t make up compliments in a goodbye email to coworkers. People can see through that like a break-room window. Find things you like about others, or focus on fun memories or things you have in common. Leaving the company is awkward at times. Leaving without a thank you letter to colleagues on your last day of work even more so. Focus on the relationship. A goodbye letter should leave them thinking highly of you. So—make it all about them. Add details like what you learned from them, something you have in common, or a funny moment. Include copious contact info. It’s a welcome mat that shows you value the connection. Do you have questions about how to write a farewell letter to coworkers? Want to share an example of a farewell email that worked for you? Give us a shout in the comments. We’d be happy to reply!